The sensual smooth sounds of jazz are meant to relax the heart and warm the soul. If you are like us, your Fantasy season has probably been more frantic like the Queen classic “Bohemian Rhapsody.” We are not saying we’re a saxophone that anyone can play. We would prefer to be one of those old-time pianos that plays itself. Basically we strive to be music to your ears but you must realize that we are merely an orchestra pit to your chorus. Together the harmonies will flow as we present to you our Wire Troll picks for Week 13. Josh McCown, Tampa Bay Buccaneers (CBS: 60 per cent; Yahoo: 33 per cent): We were all confused when Tampa made the move back to McCown. Now we view the benching of Mike Glennon as HC Lovie Smith trying to save face (Smith was certainly complimentary of McCown after the win over Washington in Week 11, as you can see in the video below). 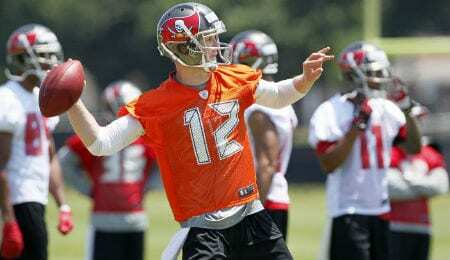 McCown is not a claim and start type player but he is a quality backup. If defenses ever solve the Mike Evans puzzle, McCown has Vincent Jackson and maturing TE Austin Seferian-Jenkins to lean on. McCown has been in this league a dozen years and you don’t stick around that long without being able to make adjustments. Three turnovers vs. his former team was merely a case of him pressing too hard and we don’t see a benching in his future for this season. Marcel Reece, Oakland Raiders (CBS: 2 per cent; Yahoo: unowned): While Latavius Murray stole the show in the first half on Thursday before suffering a concussion, it was Reece leading the charge on the game-winning drive. It was back in 2012 that Reece was actually a Fantasy stud for a three-game stretch. He may be listed as a fullback but here’s hoping the Raiders realize he can contribute with quality touches. He does remind us of former Oakland TD vulture Zack Crockett but he also shows Tom Rathman-like traits with just a dash of Earl Campbell-like gusto. Nab Reece and hope you can start him in a week or so. Chris Hogan, Buffalo Bills (CBS: 5 per cent; Yahoo: 2 per cent): We touched on Hogan on our Podcast two weeks ago and he has continued to be a reliable option. He is essentially QB Kyle Orton’s wingman. PPR alert: Prior to Monday’s two0catch performance (it seemed like everyone but Andre Reed got a target), Hogan had 25 receptions in just six games on the active roster. He is not going to pull in 10 receptions for 150 yards in single game anytime soon but in a pinch you could be rewarded. Dynasty owners take note as we could have a modern day Don Beebe brewing. Kenny Stills, New Orleans Saints (CBS: 60 per cent; Yahoo: 33 per cent): We recommended Stills in our Wire Troll just over a month ago. Now rookie Brandin Cooks is done for the year and Stills is the next man up. His Monday stat line of eight receptions on nine targets for 98 yards should tickle your “entering the playoffs” ears. Only the almighty Jimmy Graham received more targets than Stills. Marques Colston is a turf cut away from making Stills WR1 in “The Big Easy.” Stills is not the biggest or faster WR there ever was, he is just a playmaker. Michael Floyd owners, we are looking at you! We know you don’t want to drop Floyd but are you seriously ever going to play him again? Jermaine Gresham, Cincinnati Bengals (CBS: 19 per cent; Yahoo: 8 per cent): When Cincy drafted Tyler Eifert in 2013 it seemed Gresham’s days in Bengal stripes were numbered. My how this season has told a different tale. Eifert is currently on short-term IR and is expected to return, yet no prospective date has been named. Meanwhile Gresham has absorbed 38 receptions on 51 targets with a pair of TDs. In an offense that features superstar A.J. Green and the budding Mohamed Sanu, you can bet your snow shoveling duties Gresham sees single covers almost exclusively. Crave more Fantasy football chatter? Then join us every Wednesday at 1:30 p.m. EST for RotoRob Fantasy Football Weekly Podcast on Blogtalkradio as we commit personal fouls and chop-blocks for 90 minutes or so each week. Tune in here.